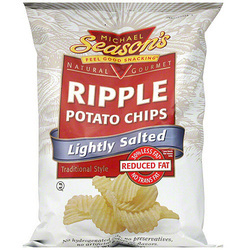 The Regular Chips of this flavoring were thicker than advertised (Thin & Crispy), and the additional depth of the Ridges on these Chips made them even crunchier. There was no oil to soften or harden them up, so they happily munched away in a somewhat quietly spoken manner. 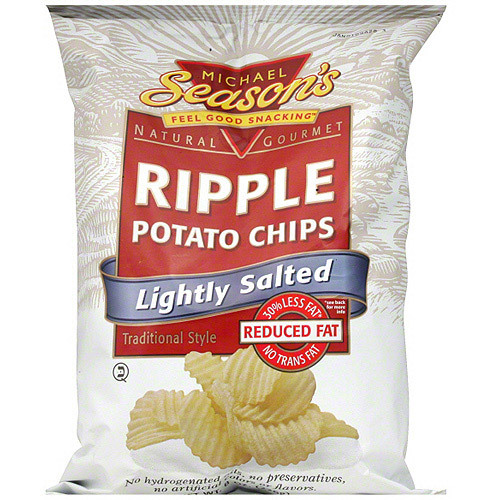 This completes Michael Season's set of Lightly Salted Chips. They have Kettle Cooked, Regular and Ripple. These Ridged Chips had a little more character, simply because of the curves of the Chips and the wide and even Waves. However, they were still plain, very pale and lacking seasoning. As they are the same Chips, but with 'Ripples', this is the same write-up we provided the Taste Test section of the Lightly Salted Regular Chips version: While regular readers will know we do not consider ourselves great judges of plain or traditional Chips at Chips & Crisps (we prefer to leave that to those advised by their doctors to stick to Chips of this nature), these did appear to have a little flavor. There was a mix of oil and salt that worked nicely to bring out a fluffy potato taste. Not much, and we would make sure these accompanied an all singing all dancing sandwich, but there was definitely a hint of flavor!